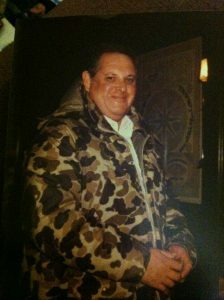 Today is Memorial Day, and on this day I honor my dad, Jacob, who left this world on February 2014. 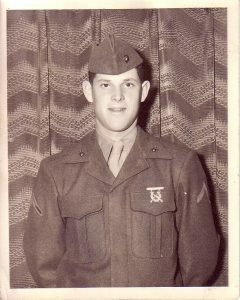 I salute my dad and all the men and women who have served this country. 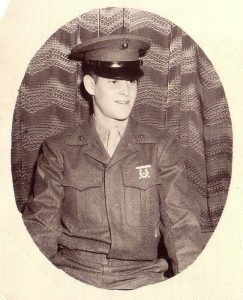 Of course, Memorial Day is to honor those who died in service, and mercifully, my dad did not. However, he often reflected on friends he lost during the Korean War, and this day was important to him, as it should be to all of us in this country. My dad was a boy in Brooklyn during WW2 and loved to tell stories about the neighborhood. 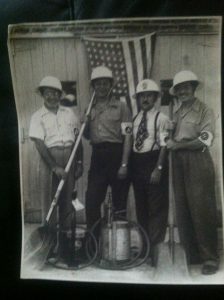 This was a picture he had of my grandfather and neighbors. When I look at it, I can hear my dad’s cute giggle as he told this story: There were concerns that we would be bombed and these gentlemen were the team that was tasked with extinguishing fires in the case of a bombing. My dad never stopped laughing as he pointed out the little bucket, which would need constant refilling, and the short hose that would not reach very far, clearly not the most effective method for dealing with the situation! 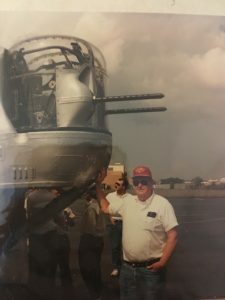 Daddy at Mitchel Air Field on Long Island. The Cradle of Aviation Museum and events at Mitchel Field were favorite destinations for my dad. 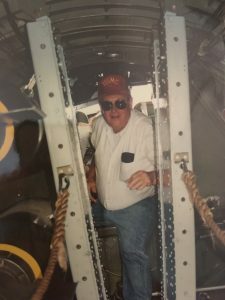 Since he was trained as a pilot, he loved to see the old planes. I went there with him a few times and although I cannot say I shared his enthusiasm, I loved to see him so happy. And, I felt a lot of pride to see him meeting other veterans and sharing stories of their time in service. I proudly display in my apartment his model of the F7, the plane he flew, along with one of his USMC caps. Not a day goes by that I don’t think of and miss my dad. I miss his laugh, his kindness, his advice, his sense of humor, and his history lessons. I have to admit that I’m glad he’s not witnessing the current events in this country. He’d be devastated and frightened for my future and the future of the next generations, and he would also be reminding me that history does indeed repeat itself. I do wish I could call to discuss things with him, knowing that I would be holding the phone away from my ear because he would definitely be yelling! Semper fi, Daddy! I love and miss you! Disney During World War II: How the Walt Disney Studio Contributed to Victory in the War is a fascinating coffee table book published in 2014. Although it was published after my dad passed away, I bought the book because it reminded me of my dad and how much we embraced each other’s lives. Walt Disney Treasures: On the Front Lines, is a 2-disc DVD set, released in 2003, which highlights Disney’s contribution to American military participation in World War II. This collection contains 32 short films used for training, propaganda and education. This set also contains the feature-length Victory Through Air Power, a propaganda film not released since its 1943 theatrical debut. My dad was always amused at my ability to find this connection between my love for Disney and his love for WW2!